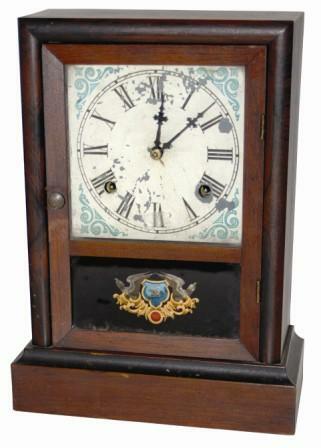 Waterbury Clock Co. "Cottage Extra", ca 1881. Original 13" rosewood case is very nice, but very smoke dirty, never cleaned or polished. Two original glasses, door latch, pendulum, gong, hands, and the original painted dial. There is some fading and some chipping on the old dial. Complete paper label inside. 8 day movement is complete but did not run it. Ly-Waterbury No. 1506.